Dubai is one of the most highly regarded destinations in the world. In fact, almost 16 million tourists visited Dubai in 2017 and millions more have added visiting Dubai to their wish list. Travel experts have already predicted that the country will host even more visitors this year. Tourists are intrigued by the magnificence of the many flamboyant skyscrapers that elegantly tower above the mysterious Arabian desserts. 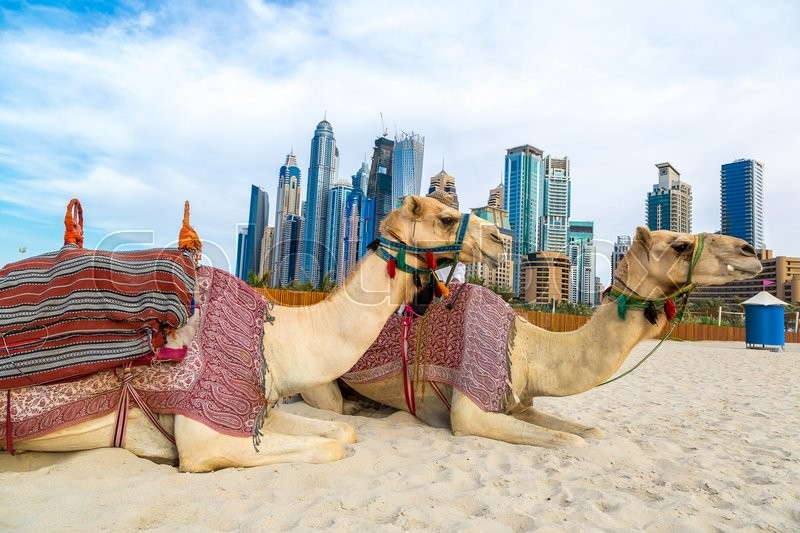 Dubai is often referred to as a playground for hot shot celebrities, famous athletes, and multimillionaires. It earned this reputation because every square inch of this country features luxury and decadence at its finest. 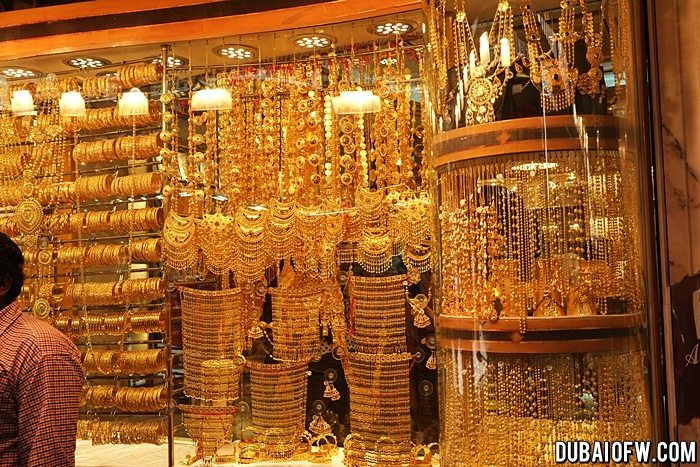 After all, Dubai is one of the wealthiest cities in the world. It is home to some of the world’s finest restaurants, most expensive luxury brands, tallest buildings, fastest cars, and most luxurious hotels! How many of us will ever get to ride a camel in our lifetime? Be warned though, this adventure is not for the faint of heart. If you are brave enough to try horseback riding, you are likely to enjoy riding a camel. It should be noted that riding a horse feels quite different from riding a camel. It will feel a little jerky, especially since a camel has one or more large humps. Regardless, these animals are usually very docile and you are in for quite the treat. When you are finished riding the camel, you can take an instagram-worthy photo right next to it. Touring the mysterious Arabian Desert will make you feel that you are in the middle of an action movie. You have the option of doing so on camel, horse-back, or in a luxury SUV like a Hummer. These tours are usually done in the cooler months and late into the evening, so there is no need to worry about the heat. The best part of these tours is arriving at an Arabian fortress and spending the night there like many generations of the native Bedouins have done. You will be able to indulge in a five star meal while gazing up at the unimaginable beauty of the stars above. Being in the middle of the desert and away from the bright city lights means that the heavens above will indeed be an awe-inspiring sight to behold. It is hard to believe that Dubai was not always the luxurious destination it is today. Most of its modern developments occurred within the last 20 years. The Dubai Museum gives you the opportunity to see firsthand that the country was once just a modest fishing village. It also offers you the opportunity to experience what life was like for the natives back then. The museum is strategically housed in the Al Faidi Fort, which is the oldest building in the country. It was built in 1787 and served as a military storage facility and prison. It did not become a museum until it was renovated in 1971. The museum perfectly preserves artifacts from as far back as 3000BC. It is almost like stepping into the past of this beautiful county. If you are in the mood to continue experiencing the authentic culture of the natives you will enjoy taking a trip to a traditional souk. This is the equivalent of your everyday farmer’s market. The only exception is that the venders are selling gold, exquisite rugs, exotic spices you have probably never heard of, and other authentic native wares. The perfume souk is especially enjoyable because of the tantalizing array of exotic fragrances. You can look around or even try your hand at bargaining with a vender. The Big Bus Tour brand is a feature you often see in iconic cities. 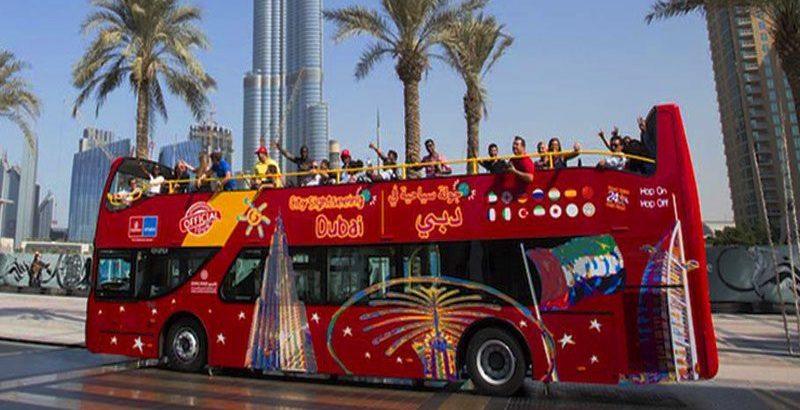 It should come as no surprise that you have the option of enjoying one of these Hop On Hop Off tours in one of the most in-demand tourist destinations on earth. The country has one of the most straight forward and logically road networks. All of the major attractions are on roads that branch off from country’s main highway, which is known as Sheikh Zayed Road or SZR. You can view the city through the eyes of a native and a tourist at the same time. The tour guides will thrill you with stories about each of the amazing buildings and attractions along the way. The country itself is also a sight to behold. There is a water fountain at each major stoplight, no two buildings will have the same design, and the entire city is kept in immaculate condition. You will enjoy every minute of this tour. 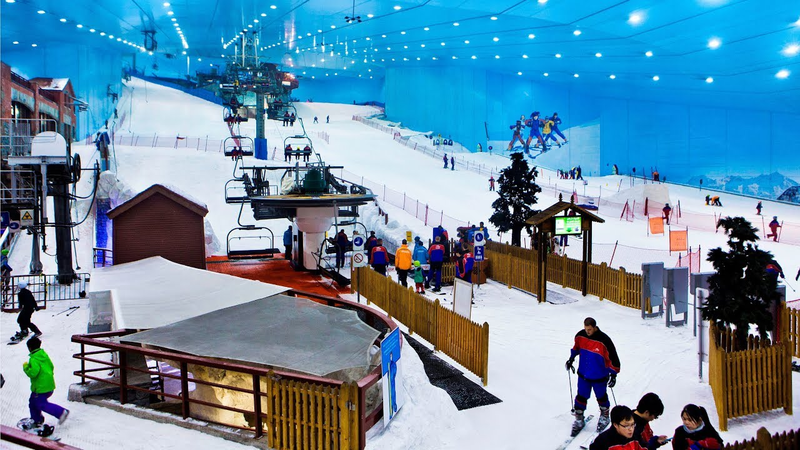 In case this country wasn’t amazing enough, it is also home to one of the largest indoor ski resorts in the region. Who even thought they would be able to enjoy skiing in the middle of a desert? The slopes are designed to accommodate expert skiers and those trying it for the first time. There is even a play area for kids and live penguins running about to keep you entertained. It will certainly be a one of kind experience. 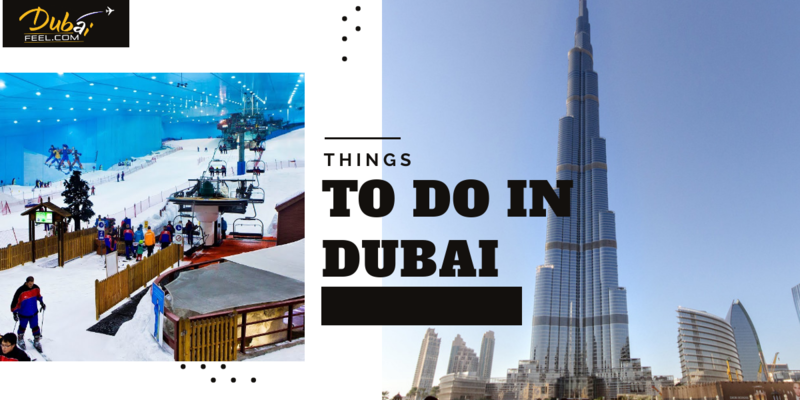 Another integral aspect of your trip to Dubai is stopping at the Dubai Mall. 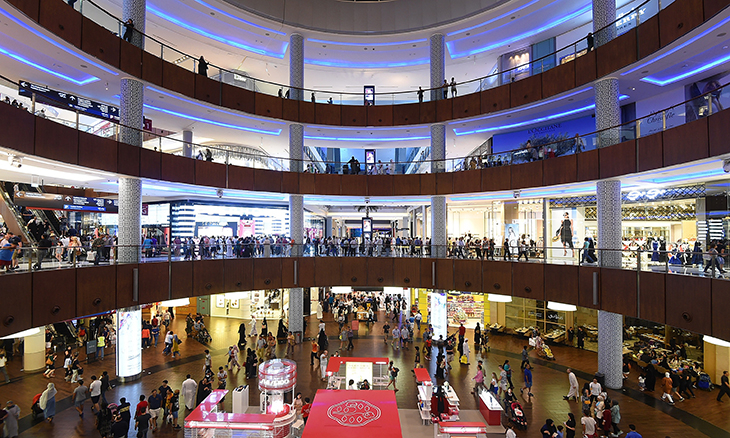 When the total land area is measured, the Dubai mall is listed as the second largest mall in the world. It is highly unlikely that you will be able to see the entire mall since it is home to over 1200 different stores. This includes restaurants, clothing stores, and entertainment shops. Since this city is known for featuring the finer things in life, these stores include some of the most luxurious and exclusive brands in the world. Once you step inside, it is easy to see why over 750,000 thousand visitors come to the Dubai Mall each week. Statistics have indicated that this mall receives more visitors than other iconic landmarks such as Times Square in New York and Niagra Falls in Canada. The mall is almost 6 million square feet in size, which provides ample space for its many visitors without feeling crowded. Green Planet is another unexpected attraction that you are sure to enjoy. 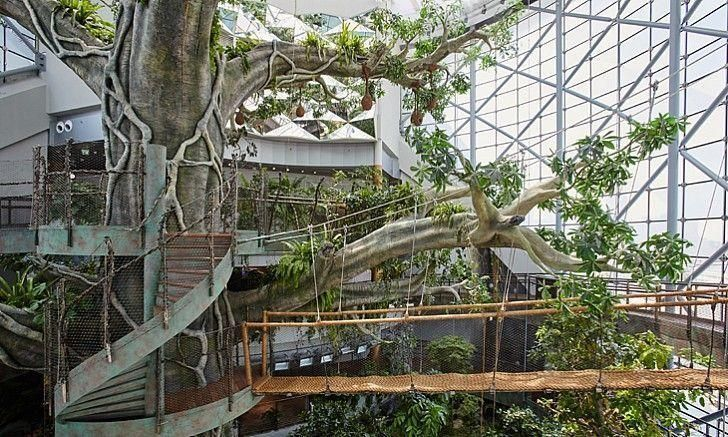 It is a large indoor rainforest that you can explore at your own pace. You will learn so much about the environment and how our actions affects animals and plants live in this rainforest. Over 3000 different plants and animals call this amazing artificial forest home. A tour of Green Planet is one of the safest ways to enjoy the breathtaking beauty of a tropical rain-forest. 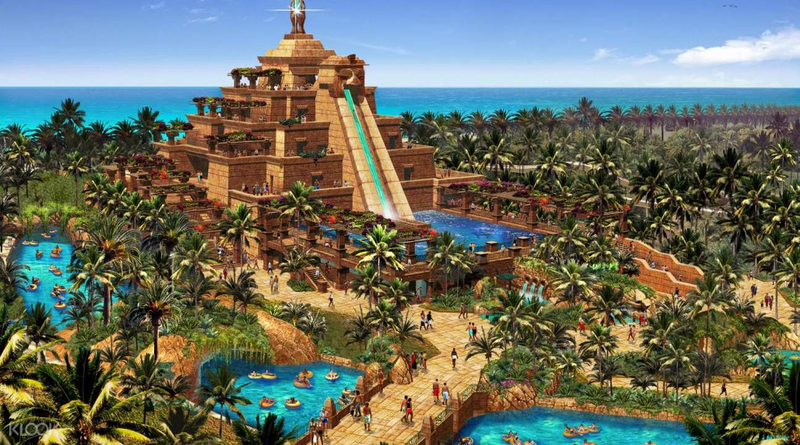 While it is true that you can find an Atlantis adventure park in many of the world’s most beautiful countries, it is highly unlikely that the experience will compare to visiting the Atlantis Adventure Water-park in Dubai. Firstly, you will marvel at the idea that the adventure park is built on an entirely man-made, yet surprisingly realistic looking island. You can also choose between daintily lounging on the pristine white sands of the beach or you can enjoy one of the many hair-raising water slides. Just imagine watching a shark gingerly swim past you as you are rushing though a water slide at top speed! This is the kind of adventure that you brag about at family dinners. 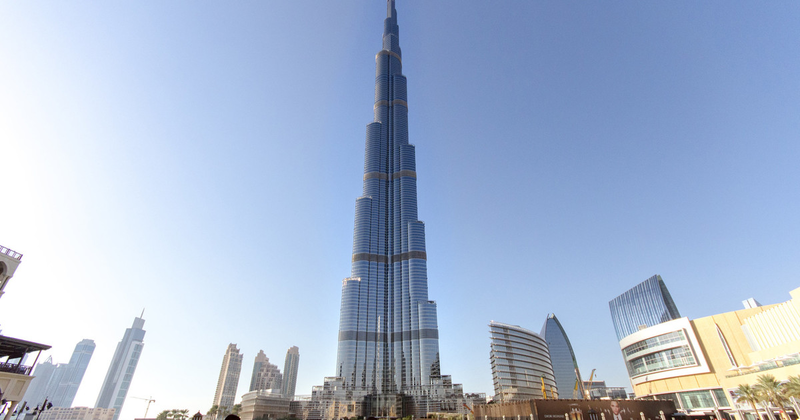 There is no doubt that the Burj Khalifah is the most famous landmark in Dubai. It thus goes without saying that no trip to Dubai could ever be complete without visiting this amazing 163 storey edifice. Just imagine the view from the deck of the world’s tallest building. You can see the beauty of the entire city from this vantage point. Watching the sun set or even the synchronized fountain show down below will be a sight to behold and one that you will not forget anytime soon. There is a lot more to see and do in Dubai, the flamboyant cousin of the rest of the United Arab Emirates. You can also get a Henna tattoo, drive an ATV through the dessert, buy jewelry at a gold ATM, drink champagne while touring the city by boat, and so much more. Despite all the excitement, traveling to a new country can however present a number of challenges, especially for first time travelers. Here are a few tips to ensure that you get the most out of your once in a lifetime trip to Dubai. Do not make the mistake of trying to do too much in one trip. While it is realistic to try and get the most out of your money, you will wear yourself out trying to rush from one attraction to the next. It would be wise to allow a sufficient amount of time between each attraction so that you will have enough time to enjoy the best of each location. 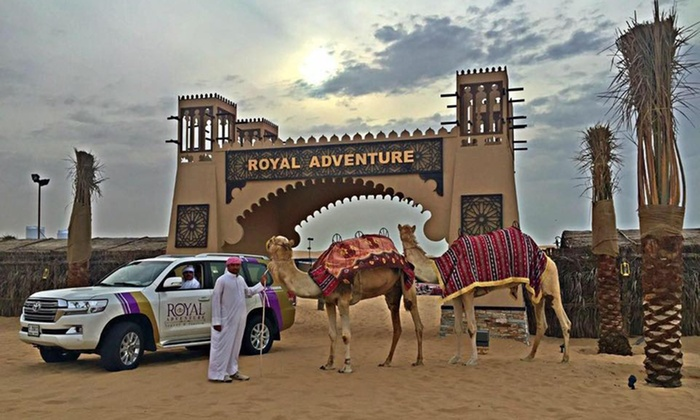 Visiting a country as stunning as Dubai and not taking the time to enjoy the best of what it has to offer is tantamount to racing through a succulent meal would ruin the experience. Resist the urge to over schedule your trip. Remember that buses get delayed and you will have to make a number of restroom stops. You can create a very tense atmosphere by trying to control every aspect of the trip. In other words, try to remain calm even if things don’t always go your way. Cultivate the fine art of patient since this will come in handy if and when your plans fall apart. Try to look for the positive in every situation. It is highly likely that the little mishaps that might occur on your trip will become fond memories that you can share with your loved ones for decades to come. Most of us end up sick after returning from an adventurous trip abroad. This may in part be due to the change in climate, but often times it is because we forget to take care of ourselves while we are away. That is because we end up indulging in too much of the foods that we need to avoid and not drinking enough water. We also tend to get a lot less sleep. It would be best to think ahead and try to take better care of yourself. Research menu options at your prospective accommodation before making a reservation. That way you will know whether they will be able to accommodate your dietary restrictions. Above all else, always ensure that you will have enough of your prescribed medication with you to last the duration of the trip. Dubai is one of the safest countries in the world. Regardless, it is always a lot better to be safe than sorry. Take the necessary precautions to ensure that you keep yourself and your valuables safe. Whenever possible, travel with a group and do not leave your valuables unattended. Travel insurance also comes highly recommended these days. Do not view it as an unnecessary expense because medical emergencies can pop up at any time. Just think, one little medical emergency could deplete all the funds that you have available and ruin your trip. Why risk it? In conclusion, your trip to Dubai will be unlike any other. You will enjoy starry nights under the heaven and a culinary experience that will leave you longing for more. There is a lot to see and you will be able to enjoy it all once you take the necessary precautions. In fact, I guarantee that you will find yourself longing to visit this beautiful country again soon.